One People, One Vibe, One TRIBE! In 2009, TRIBE Carnival Band will celebrate its 5th year anniversary. 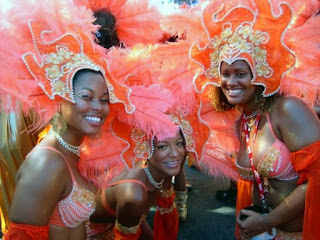 Masqueraders can look forward to many new and exciting ideas, innovations and ‘on de road’ surprises. Masqueraders will be fully entertained with the new TRIBE Rollin’ Road Party. The 2009 presentation entitled “Birds of a Feather…” will be launched in July 2008. This year ‘the early bird catches the worm’ as TRIBE will be reducing the size of the band to create a more intimate experience. The in-house designers with Gail, Lana and Monique at the helm along with outstanding new additions to the design and production teams are putting their final touches on the 2009 masterpieces. "The costumes are ‘HOT’! Hold tight…we’re gonna take flight!"